The Summer is short lived around these parts. Blink and you may miss it. If you are a New Englander these Summer hours are precious ones that don't come around too often. So making the most out of every hour is essential. Maine Blueberries - best blueberries in the world, hands down. elephant bracelet - well this is an easy one. elephants and blue, this is perfection. blue leather clutch - I have this in orange, but I think my closet needs the blue one too. Bonus, you can get it personalized. Agree on all accounts!!! Love blue in the summer! Everything blue especially blueberries!!! I think about trying that essie color every time I go get my nails done. You like? I love the leather clutch! And I love that you can monogram it! I used to say I didn't like blue ... my opinion has changed over the years ... and these blues are simply divine! Loving these precious Summer New England days! Elizabeth, I was a little scared of the color at first, but I'm totally loving it now! I say go for it. You only have to commit to it for approx 2 weeks, right? love blue - and love my special pve package that arrived today! a proper note is on the way! 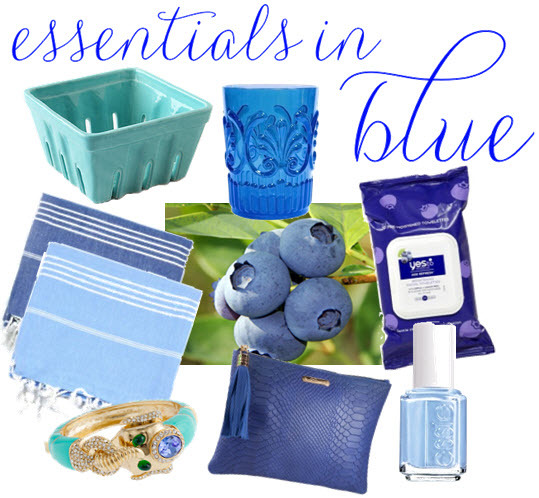 You are speaking my language here...love all things blue!